This week Awesome Stories brings you immigrants giving back, Anam Cara, buildings for tomorrow, beautiful places and graceful aging. The story of St. Jude Research Hospital is a touching one. 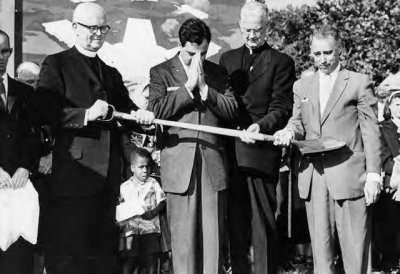 Originally founded by Danny Thomas as a way to give back and express his gratitude for the opportunities afforded Arab and Lebanese immigrants in this country. To this day all the services provided by St. Judes are provided free of charge to families and the children who are patients. The hospital is supported by the dedicated efforts of the American Lebanese Syrian Associated Charities (ALSAC) which was founded strictly to be the fundraising arm of St. Jude. So it’s an interesting story of how an Arab family was welcomed into the US, made good and decided to give back by creating a hospital dedicated to helping reduce childhood disease. In case you didn’t know like I didn’t, Danny Thomas’s real name is Amos Muzyad Yakhoob Kairouz and he was born to Arab and Syrian immigrant parents. We all need love, acceptance and friendship. This beautiful phrase, Anam Cara, captures the essence of the deepest friendship. It means literally soul friend, someone we connect with on the deepest levels, offering a place to be safe, seen, heard and share our deepest self with one another. I feel I am finding that space with Steven, my roommate, in offfering me a physical and energetic place to relax, reboot and find my way home to heart and spirit again. In this kind of friendship, we are accepted and embraced exactly as we are, without the need for pretense, masks or defenses of any kind. May we all have the gift of anam cara friendship that awakens us in order to free the beautiful potentials within. Here are 10 inspired buildings that hint at what might be the buildings and living spaces of the future. All of the buildings have inspired form and function; filtering air, safety of residents, eco sensitive and more. 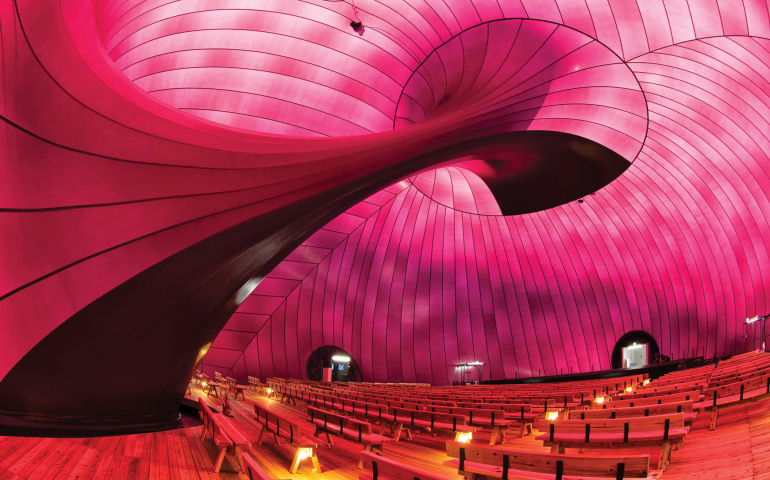 My favorite is the flowing, sensual shape of this mobile concert hall called Ark Nova designed by Arata Isozaki and Anish Kapoor. The building can be transported by truck, inflated and installed in 2 hours to use for temporary shelter, art and concerts. Enjoy! This is a wise and heart-felt post on aging by blogger Sandra Pawula of Always Well Within. I love how she reminds us that obsessing over our bodies and physical appearances can be a distraction or even escape from embracing our bodies and the reality of aging. At the same time, Sandra lovingly reminds us to wake up to our divinity to allow grace to enter all aspects of our life. Then we can truly age with grace and be a light in the world. I highly encourage you to read this post and invite more grace into your life. From Bored Panda, here are 11 beautiful places. Some of the colors are stunning like in Red Beach, China. It warms my heart to look at such beauty and I’m grateful that people share their delights from around the world. And don’t forget to look for beauty where you are. Thank you, Brad. As of my last birthday (in Oct) I began my 60th year on this little blue planet,however I have come to realize that that is merely a system of accounting that has nothing to do, really, with my actual age, worth or value. ❤ Gee, guess which of your articles had the greatest impact? Wonderful links here Brad.. the top one especially interesting reading those buildings.. 🙂 wow, no wonder they look off-worldly lol.. 🙂 amazing structures.. 🙂 the ageing, well I hope I am ageing with ‘Grace’ 🙂 lol..
Wishing you a peaceful Perfect weekend..
All awesome, Brad. Beautifully curated. Beautiful and uplifting stories again, Brad, all of them. Loved the Aging with Grace post in particular. Wonderful advice. Ah, Brad… I shared your blog in the comments section of another great blog. 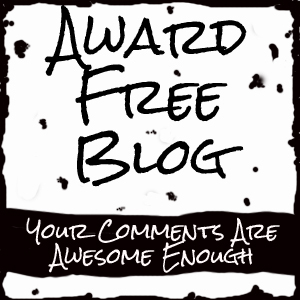 I said that your blog’s title says it all, “Writingtofreedom.” Rarely do I share when I do these things, as the actions themselves are felt as ripples in the world. Anam Cara is a fabulous word. Wow! I did not know that about Danny Thomas — what a perfectly timely story for you to share. I’m blessed by several soulfully deep friendships but have never heard the term “anam cara” before. So happy you are enjoying this type of connection with your new roomie. And I would love to stroll through that gorgeous Japanese park…Thank you!!! I wish you the Merriest of Holiday Seasons, Dear Brad!!!! Thank you dear Shauna. I’m always touched by your kind words and appreciate our connection. I’m trying to appreciate my new home and wondering what adventure I might create this year, including some travel. 🙂 Happy Holidays to you and yours!